We are currently offering this outstanding old. 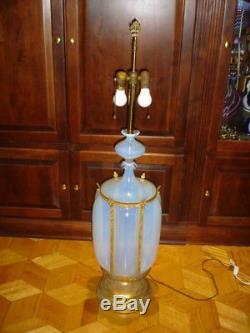 And rare MURANO GLASS MARBRO COMPANY HUGE hand-blown opalescent glass lamp. 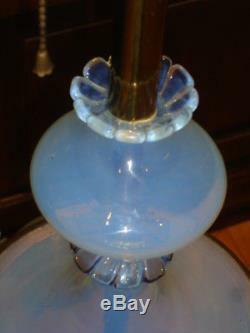 This lamp is in great condition without any damages. It great for Modern style and made in 1950, Mid-Century, modern period. 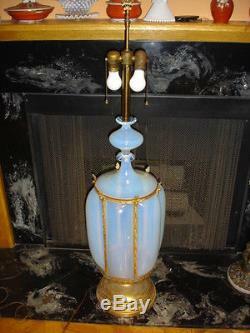 This lamp has great brass decor over opalescent glass. Old Double Cluster Electric Lamp Pull Chain Sockets. Can use separate and together-we made new rewiring and working order is good. 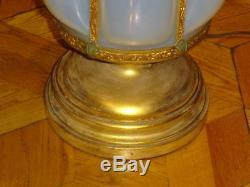 The gold color wood lamp base has some wear, but it is just proof of age... 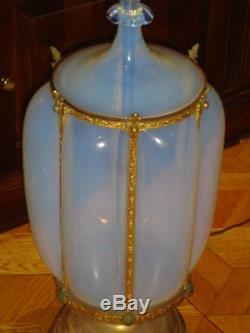 The lamp will looks absolutely unusual! The lamp will look great in any home! Also great as a present for someone special. 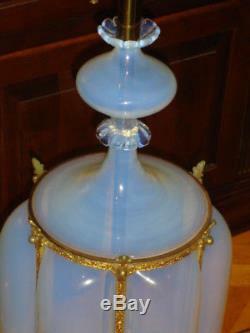 Sizes: Length 44.5" & Width 10 3/8" glass part tall 24. Please be informed that we wrap all of our lamps professionally to avoid any damage from occurring during transit. Due to professional packaging, the box is usually slightly heavier and bigger then most because of double boxing and cushioning. 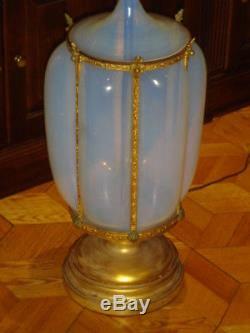 The item "MARBRO-MURANO BLUE OPALESCENT GLASS BRASS HUGE LAMP Barovier hand-blown 1950" is in sale since Sunday, February 25, 2018. 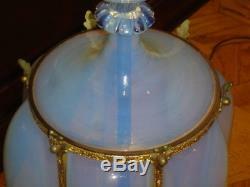 This item is in the category "Antiques\Decorative Arts\Lamps".